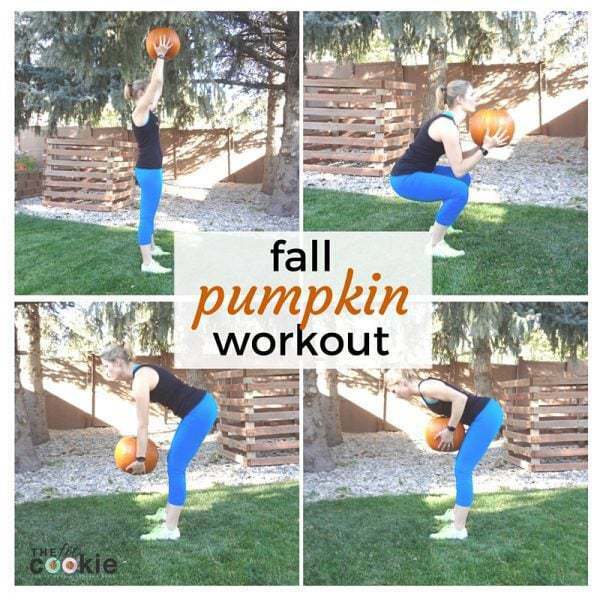 Celebrate fall and pumpkin season with this fun fall pumpkin workout – you can do this one just about anywhere using a pumpkin instead of a medicine ball! Hi fitness friends! The fall season is in full swing and I hope you are enjoying your fall so far! Fall is a busy time with school activities and fall holidays, but with everything that is going on, make sure you’re taking a little time to get outside and get a workout in. I am pretty excited to share this workout with you: it’s so much fun to try something new! 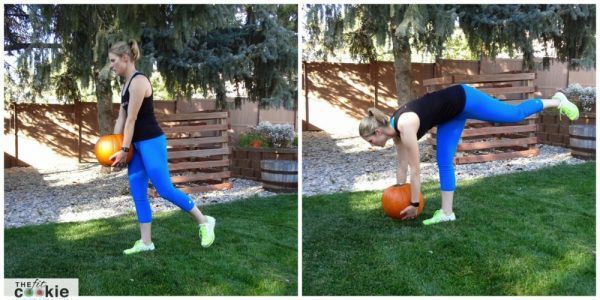 Chances are you already have a pumpkin at your house, so finding weight and space for this workout should be pretty easy. If you prefer a medicine ball, you can certainly use one of those, too! 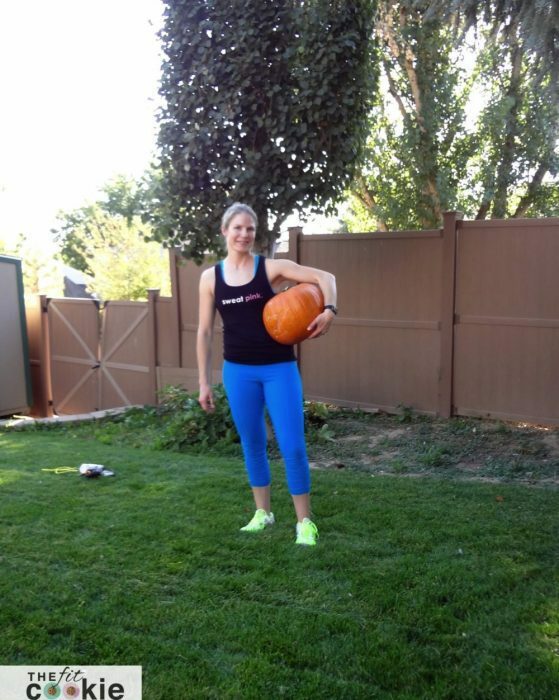 But if you don’t have a medicine ball, then a pumpkin makes a fun and festive alternative. 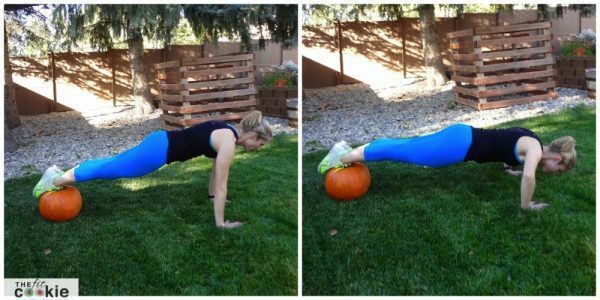 Once you have finished your workout, you can carve the pumpkin up or paint it for decorating, too. 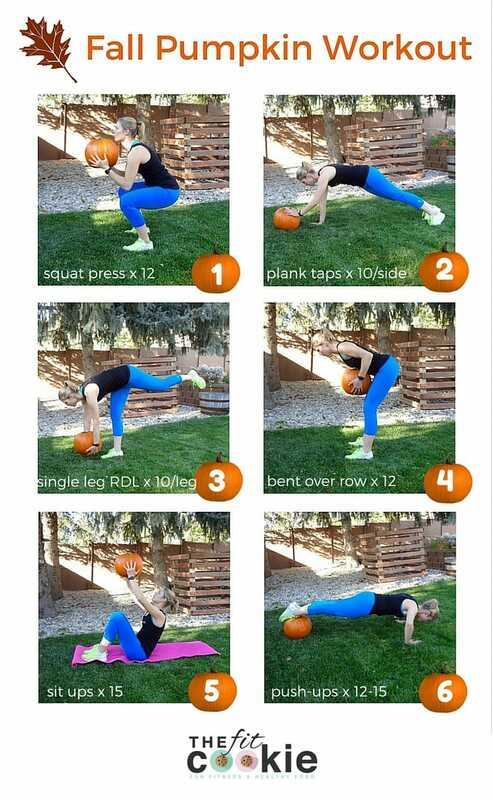 This workout is challenging for sure: the pumpkin I used for this was 18 pounds, the weight of a heavy medicine ball. Find a pumpkin that is heavy for it’s size, is sturdy, and hasn’t gotten soft on the outside. Make sure that it’s also not so big that you can’t safely hold onto it during your workout. If you have small hands, choose a smaller pumpkin. The perfect place to do this workout is outside so you can enjoy the fresh air and beautiful fall colors! If you’re doing this workout outside, don’t forget to get a handle on your fall allergies so you can enjoy the beautiful outdoors! This total-body strength workout is performed as a circuit, with no rest between exercises and a 1-2 minutes rest between rounds. Beginners can do the circuit 2 times, and intermediate to advanced exercisers can do the circuit 3-5 times depending on your fitness level. You can do almost anything with a pumpkin that you can do with a regular medicine ball, except for ball slams obviously 😉 If you are having a tough time gripping the pumpkin, grab some grippy gloves or some football gloves to help get a better grip or wrap a few strips of athletic tape around the pumpkin. 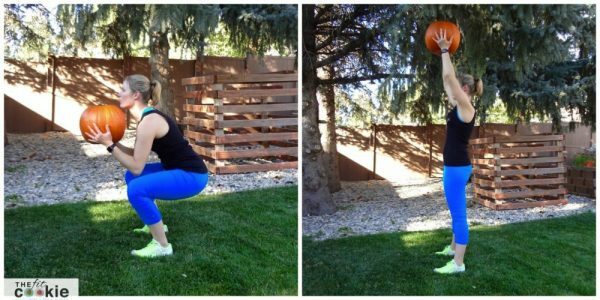 Pumpkin squat press (legs and shoulders): hold the pumpkin (or medicine ball) at chest level and perform a squat. As you rise, press the weight upward in a shoulder press. Pumpkin single leg RDL (glutes, low back, and hamstrings): this is a great balance move! Holding the pumpkin, find a place of balance on one foot. Once you have found your balance, hinge forward at your hip and lean toward the ground. Return to start and repeat. Make sure your supporting leg is slightly bent and your back is flat! Bent over pumpkin row (back and shoulders): Hinge forward at your hips, back flat and knees slightly bent. Arms are relaxed with the pumpkin or medicine ball at arm’s length. Pull your arms toward your chest and squeeze your shoulders. Return to start and repeat. Make sure you don’t have any rounding in your shoulders and lower back on this move. Pumpkin sit-ups: lie down on the floor or ground and hold the pumpkin or medicine ball over your chest. 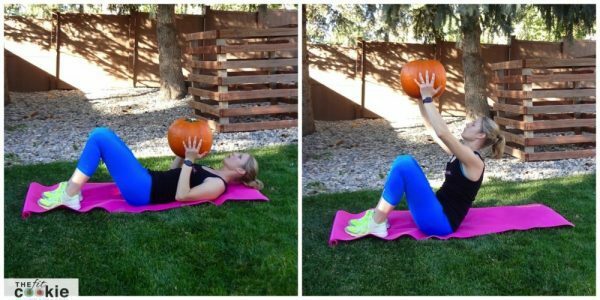 Lift your upper body up to a sit-up while extending your arms and reaching the pumpkin to the ceiling or sky above you. Return to start and repeat. Keep your chest elevated and your shoulders drawn down and back in this exercise as much as you can. 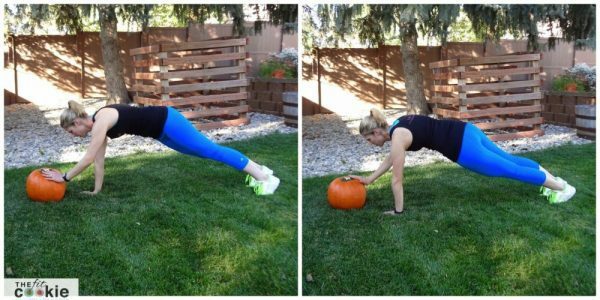 Pumpkin push-ups: place your feet on the top of the pumpkin or medicine ball and bring yourself into good plank form with wide hands. Wrists should be under your shoulders. Do a push-up and return to start. Keep your core strong and don’t let your hips or low back sag during this move. If you need to modify, drop to your knees. Disclaimer: make sure you consult your physician or medical provider before beginning any new workouts. Always adjust your workouts depending on your fitness level and abilities. This post is for informational purposes only and is not meant to replace medical advice. Im so seizing this as THIS WEEKS EXCUSE why we shouldnt throw out our pumpkin. I have a pumpkin sitting on my front step that would be perfect for this. Appreciate the printable PDF as a quick resource! So fun – great idea!